Gels are used in a number of applications, including wound dressings and fibre optics. They consist of a 3D network made up of one or more gelators held together by various non-covalent interactions (hydrogen bonding, π-π stacking, van der Waals interactions…) which serve to trap solvent molecules. Depending on the solvent and gelator used, the structure and/or viscosity of the gel can be controlled. A popular method of gel formation is through the addition of a gelator, or thickening agent, to a solution or solvent. Specifically, the development of low molecular weight gelators (LMWG) for the formation of new gels is a very active area of research. Once you can control the shape and viscosity of gels, as well as when and how they form, the possibilities for these systems are endless. Many research groups have attempted to develop tools that allow gelation to be predicted for a given solvent, but most of these are limited to particular solvents or gelators. There is still no ‘magic bullet’ available for predicting the gelling ability of any solvent. Having said that, Matthieu Raynal and Laurent Bouteiller at UPMC University of Paris and CNRS in Paris, are one step closer towards addressing this deficiency. In their work, Raynal and Bouteiller applied Hansen solubility parameters (HSPs) to predict the gelling ability of LMWGs in various solvents. These parameters were initially developed to determine solubility, or to see if a given substance will dissolve in another. To reach this conclusion, three contributions must be considered: dispersive interactions, polar interactions and hydrogen bonding, and these values are then plotted on to a 3D graph, called Hansen space. The closer two molecules are to each other, the more likely they will dissolve each other. Although not without its limitations, HSPs have successfully been used by polymer chemists to select solvents for paints or coatings. 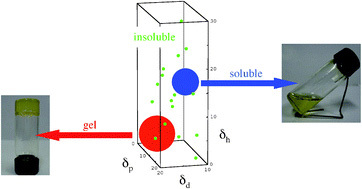 To determine if these values could be used to predict gel formation, the duo gathered information on a number of solvents and LMWG sets for which the HSPs were known. When the team plotted the information in to Hansen space, they were surprised to find for each LMWG studied that gel-forming solvents clustered together. Raynal and Bouteiller were then able to determine the so called ‘gelation sphere’ (a region of the Hansen space in which solvents forming gels were located in preference to those that form a solution or insoluble species) specific to each LMWG. They then plotted the distance between each solvent and the centre of the sphere predicting the solvents that would form gels, which were easily separated from those that formed a solution or insoluble species with a particular LMWG. This work could prove to be a real time-saving method for predicting the gelation of a LMWG in any solvent, but first, more LMWGs need to be studied, in a wide variety of solvents. Hopefully gel scientists around the world are on the case and we will soon be able to predict gel formation of a LMWG in any solvent. Scientists in the US have developed a new photodynamic therapeutic reagent that works in the absence of oxygen. Photodynamic therapy (PDT) is an emerging treatment used to eradicate premalignant and early-stage cancer, and also reduces tumour size in end-stage cancers. PDT works by exposing the tissue sample to a light source, which excites the PDT reagent causing singlet oxygen to form due to a reaction with the more common triplet oxygen. The resulting singlet oxygen then invokes cell death in tumour cells. The PDT reagent has been designed by Karen Brewer and co-workers from Virginia Tech, where they have shown its capabilities for binding and photocleaving DNA under red light irradiation. The anti-cancer complex [(bpy)2Os(dpp)RhCl)2(phen)]3+ has two metal centres; the osmium portion is capable of photocleaving DNA by singlet oxygen generation and the rhodium part is capable of binding to the DNA in the first place. Crucially, this is the first complex that works in the absence of oxygen. Tumour cells are often oxygen-depleted environments and therefore a treatment that functions in the absence of oxygen is an important step forward. Future investigations will centre on the bioreactivity of this and other related complexes. Interested in finding out more? Then download the ChemComm article, which will be free to access until 25th July 2011. Peter Roesky, Siegfried Blechert and co-workers at the Karlsruhe Institute of Technology and the Berlin University of Technology have reported the first use of a dizinc complex as the catalyst in a hydroamination reaction. Hydroamination is the addition of an N–H bond of an amine to an unsaturated C–C bond to give a molecule that contains nitrogen in one step. This is particularly important because many current amine syntheses are multi-step processes. 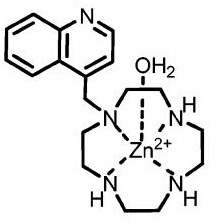 Zinc complexes are advantageous for hydroamination as they are relatively cheap, air and moisture stable and tolerant to a wide variety of functional groups. With this in mind Roesky and Blechert decided to test the zincocene complex, Zn2(η5-C5Me5)2, for its hydroamination activity. This complex was discovered in 2004 but it is the first time that it has been used as a catalyst. The team found that the catalyst worked well with good yields and conversions and that it tolerates many functional groups. Want to find out more? Then download the ChemComm article for free today and leave a comment below. A new tool for the selective detection of dopamine in water, with potential applications to urine and serum, has recently been developed by the Chinese research group led by Fang Zeng and Shuizhu Wu. 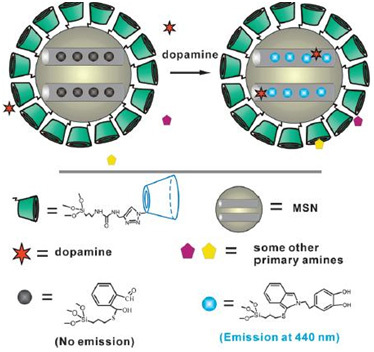 The new sensor, with a detection limit of 50 nM, is based on the fluorescence response obtained when dopamine reacts with a molecule containing an o-phtalic hemithioacetal (OPTA). The selectivity of the system over other amino acids and primary amines has been obtained by trapping the OPTA-bearing group within the pores of microporous silica particles and enhanced by anchoring a β-cyclodextrin (β-CD) layer on the surface of the particles. The β-CD, due to their ability of supporting both hydrogen-bond and hydrophobic interactions, serves as a barrier for most interfering molecules but allows dopamine to reach the pores. The authors believe that this derives from its limited capability of forming both hydrophobic and hydrogen-bonds. Repeated tests proved that without the β-CD layer the selectivity is lost and that out of 24 potential interfering molecules, among which common amino acids, epinephrine and others, only two (histidine and norepinephrine) gave responses comparable to dopamine. While the results obtained for norepinephrine can be ascribed to the structural similarities to the target molecule, the reason behind the behaviour of the sensor towards histidine are currently unclear. Dopamine is an important neurotransmitter involved in behavioural responses, sleep regulation, mood and learning processes among others. A malfunction in the dopamine regulating processes and related disruptions are implicated in the attention deficit disorder, Alzheimer`s disease, schizophrenia and psychosis. Posted on behalf of Dr. Giorgio De Faveri, Web Writer for Catalysis Science & Technology. Professor Amar Flood delivered the inaugural Cram Lehn Pedersen Prize lecture at at the 6th International Symposium on Macrocyclic and Supramolecular Chemistry (6-ISMSC) in Brighton last week. The lecture, entitled ‘Binding and releasing anions with CH hydrogen-bonded receptors’, discussed his group’s efforts to regulate chloride concentrations in solution using aryl-triazole foldamers bearing azobenzene units. The foldamers can reversibly bind and liberate chloride depending on the wavelength of light shone on them. 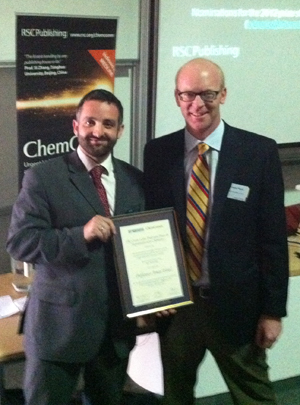 The prize was sponsored by ChemComm and Dr Robert Eagling, ChemComm Editor, presented the certificate to Professor Flood. Find out more about ISMSC in my conference blog. And don’t forget – there is still time to submit your nomination for the 2012 Cram Lehn Pedersen prize. Deadline 31st July 2011. See the call for nominations for more details. Korean scientists have used graphene sheets to make a transparent and lightweight loudspeaker which, they say, can be attached to windows and computer screens. Graphene, whose isolation led to the Nobel prize in physics for Andre Geim and Konstantin Novoselov, is a single layer of graphite. Owing to its remarkable mechanical and electronic properties, it is set to revolutionise modern technology and new uses for it are continuously being discovered. However, one of the big challenges is to fabricate large area films of graphene. Now, Jyongsik Jang and coworkers from Seoul National University have used inkjet printing and vapour deposition to deposit graphene oxide onto poly(vinylidene fluoride) (PVDF), which is then reduced to create a graphene film. This demonstrates not only a new method for making controlled graphene films, but also a new use for the material: for making a thin transparent loudspeaker. The speaker system consists of a PVDF thin film sandwiched between two graphene electrodes. 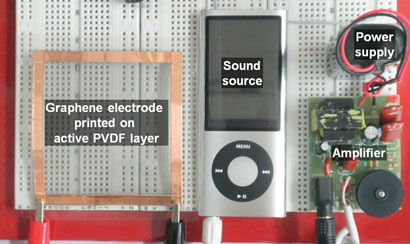 The speaker works because when an electrical current from the sound source is applied, the converse piezoelectric effect causes the PDVF film to distort, creating sound waves. Such a system would be easy to install and usable anywhere where sound is needed, Jang explains. They could even eventually be used as noise cancelling devices by creating anti-noise waves (same amplitude but with inverted phase to the original sound). To read more please visit the Chemistry World website, or download the original ChemComm communication. DNA bulges occur when one or more extra bases are added on one side of the DNA strain during the transcription process. These bases generally face either inwards or outwards with respect to the main helix. If we imagine DNA as a straight ladder, a bulge would be a half step that fails to reach the other side. DNA bulges, if not corrected after the transcription process, can often lead to mutations and to the rise of diseases and life threatening conditions. Particular DNA bulges are also relevant in the replication of HIV. Due to the importance and biological significance of these structures, many studies have been conducted towards the development of molecules that specifically target and recognise these modifications. Molecules have been developed to selectively bind to bulges containing Guanine(G), Adenine(A) and aggregates of Cytosine/Thymine(C/T), but very few show high selectivity for T alone. The group led by Janet R. Morrow, of the University of Buffalo focused on thymine, and developed a Zn(II) based macrocyclic complex that exhibits a higher than 100-fold specificity for T bulges. The complex is based on a modified cyclen backbone with a quinoline-containing pendant arm, which proved essential for the enhanced selectivity and binding abilities. Another interesting feature emerging from the study is that when tested on oligonucleotides containing single-base bulges in the stem of a hairpin or a duplex structure, binding occurred without damage to the structure of the stem and only when T was in the bulge. Several other oligonucleotides with different bases in the bulge and with thymine in the hairpin stem (no bulge) were tested to further assess the selectivity of the complex, resulting in only one example of reduced binding when the T bulge has a cytosine on both sides. NMR titrations were used to follow the binding process thanks to a clear change in the chemical shift of methylenic protons on the base after coordination. You are currently browsing the Chemical Communications Blog blog archives for July, 2011.